CAUTION: IPDM E/R integrated relays are not serviceable parts, do not remove from the IPDM E/R. 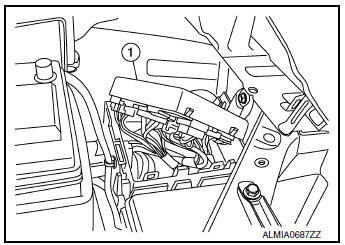 Disconnect the negative battery terminal. 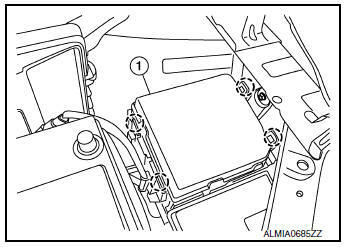 Refer to PG-75, "Removal and Installation (Battery)". Remove air duct (inlet). Refer to EM-24, "Exploded View". Release pawls on IPDM E/R cover (1) and remove. Release pawls and remove IPDM E/R (1) from the IPDM E/R case (2). 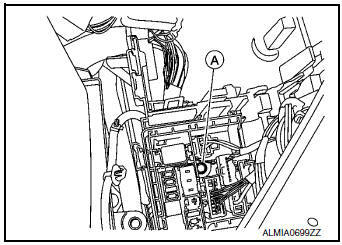 Disconnect the harness connectors from IPDM E/R (1). CAUTION: Replace the IPDM E/R if it has been dropped or sustained an impact. Release the negative battery cable and harness clips from the IPDM E/R case. Release the pawls on the IPDM/ E/R harness covers A, B and remove from the IPDM E/R case. Remove the bolts from the IPDM E/R case. 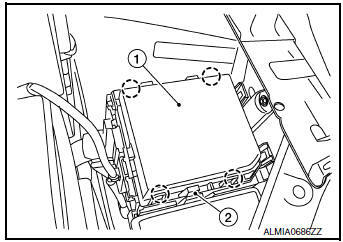 Remove the bolt (A) from the fusible link box (battery). 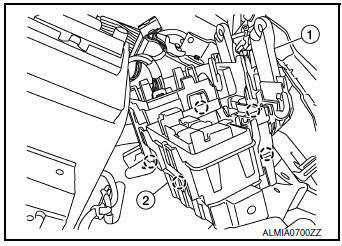 Release the pawls on the fusible link box (battery) case (2) and remove from the IPDM E/R case (1).